The following post was contributed by ACR member Murray Rebner, MD (second from left in photo) , immediate past president of the Society of Breast Imaging (SBI) and professor of diagnostic radiology and molecular imaging at Oakland University William Beaumont School of Medicine. This week I took part in a Capitol Hill briefing hosted by the Congressional Families Cancer Prevention Program of the Prevent Cancer Foundation and the Society of Breast Imaging (SBI). The topic of the briefing titled, “Breast Cancer Screening: Ending the Confusion,” was the U.S. Preventive Services Task Force (USPSTF) breast cancer screening guidelines. Representative Debbie Wasserman Schultz (D-FL) who credits mammography for ultimately saving her life joined the panelists in condemning the USPSTF guidelines. The USPSTF guidelines, if implemented, would restrict access to mammography screening for women aged 40-49, many of whom would no longer be able to afford screening because their private insurance plans may no longer cover the procedure. The Affordable Care Act mandates that insurance plans cover exams and procedures rated “B” or higher by the USPSTF. The new guidelines grade routine mammography for women aged 40-49 a “C.” In addition, women 50-74 who want to be screened annually might be denied yearly coverage since the USPSTF guidelines only gave a “B” rating for screening this age group every other year. Wasserman Schultz was clear that she and other members of Congress are concerned about the impact of breast cancer and believe that delayed detection and treatment have a far worse outcome than the harms of the USPSTF guidelines. During the briefing I questioned the task force’s expertise as well as the transparency of their methodology. I also took issue with their priority to spare women the harms of mammography, despite their own admission that screening over the age of 40 reduces breast cancer deaths by 18 percent. Dr. Elizabeth Morris, president of the Society of Breast Imaging (SBI) and Chief of Breast Imaging Service at Memorial Sloan Kettering Cancer Center, called for a moratorium on the guidelines, noting that the data used was old, discounted and did not account for technological advances, such as 3D mammography, which improves detection rates and decreases harms. Dr. Regina Hampton, Medical Director and Co-Founder of Breast Care for Washington, provided a practitioner’s view. She talked about diagnosing a 38 year old, a 32 year old and a 39 year old with breast cancer in just the last couple of weeks. So what is being done to prevent the USPSTF guidelines from being implemented? Representative Wasserman Schultz along with over 60 of her colleagues sent a letter to HHS Secretary Burwell asking her to take action. 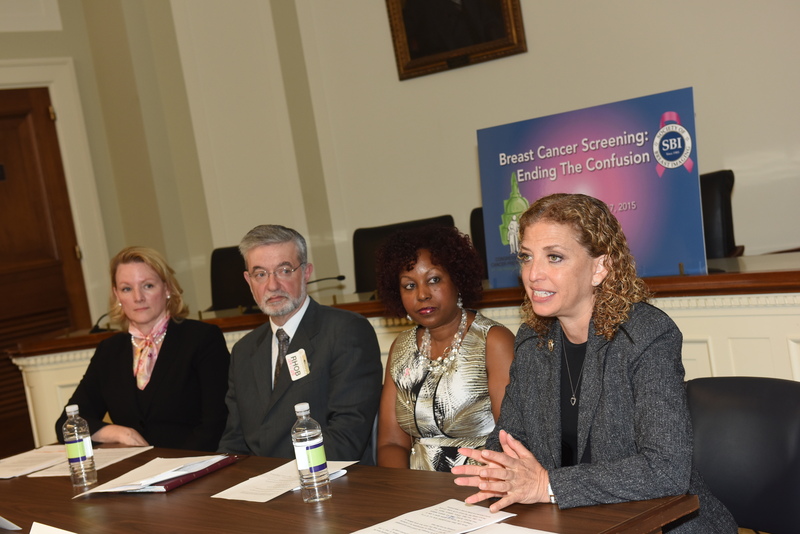 Wasserman Schultz said she will continue to fight to ensure women’s access to mammography screening is maintained. Professional societies like ACR and SBI, patient organizations like Prevent Cancer and providers like Dr. Hampton are educating policymakers, the media and the public about the potential harms and asking them to take appropriate action so that mammograms can continue to save lives.